All The Bright Places moved me. So much. Theodore Finch is known for being a bit wacky & unpredictable. Nicknamed Theodore "Freak", Finch is used to being noticed for all the wrong reasons and spends most of his time thinking of ways to kill himself. Violet Markey can't wait for Graduation after the death of her sister. Although a typically "popular" girl, Violet is unhappy and can't see a way out. When the two meet in an unfortunate circumstance on the ledge of the school bell tower, it isn't clear who saved who but when the two otherwise strangers get together for a school project, they discover things about themselves and each other that they never knew. The two characters in this book are just lovely. I felt myself more drawn to Finch than I was to Violet, but I still loved them both just the same. I really enjoyed being inside each character's head and understanding their thoughts, as the story is told from alternating points of view. The adults in this book were probably the most disappointing aspect and whilst I understand that it was probably intentional that almost every adult in this book was useless, it really annoyed me and I wanted to scream at the school Counsellor and Finch's mom numerous times throughout the book. The only adults in this book that were anywhere near acceptable were Violet's parents - who were going through a great deal themselves and despite wanting to protect their now only child, still managed to pull it together and actually be responsible adults. The plot held on to my heart throughout and ripped it out at the end with a sort of predictable conclusion. I saw it coming throughout the second-half of the book and understood the downward spiral, but I equally enjoyed watching it play out and dreaded what was coming. The quotes and references in this book were one of my favourite aspects - along with the facts about suicide as they added an extra layer to the story that I wasn't expecting. 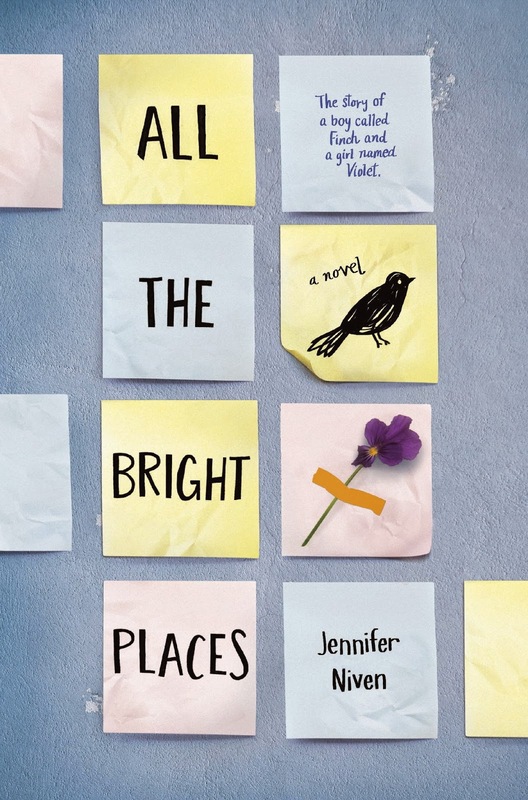 I don't like when people compare books to other books, but I would say that if you enjoy John Green's style of writing, you will enjoy All The Bright Places. Germ Magazine, the online publication that is written by Violet has actually been created IRL by Jennifer Niven, which I think is amazing! So if you've read this book, definitely check out the online Magazine too. I've also just heard that the book is being made into a film and that Elle Fanning is starring in it - so I'm super excited for that! Trigger Warning: I wouldn't advise reading this book if you are at all sensitive to issues of mental health & suicide. This review was written by regular reviewer Christina, read more about her here.